The Unfinished Swan is an exploration of creativity and its responsibilities, a youthful meditation on art and play in the form of a puzzle game. As Monroe, a young orphan, you travel the storybook world of a mad artist king, exploring the byzantine architecture of his creations while trying to find the swan, the subject of a painting left undone by Monroe’s recently lost mother. 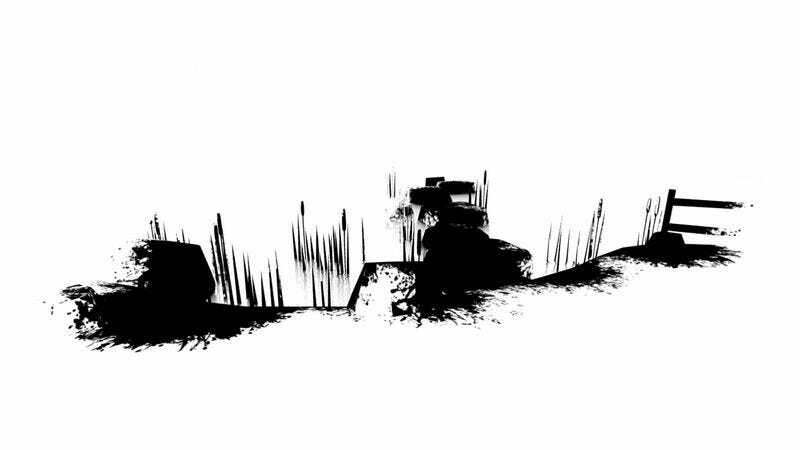 The king’s world is a minimalist post-apocalypse, a terrible mess that the game’s gentle storybook narrator describes as a result of the king’s own vanity and lack of vision—self-serving and ugly art left for you to wade through. Swan provides you with a series of toys—tools for experimentation and puzzle solving—as you explore. They are meant to reflect the world around you and give you a means to shape it, leading Monroe through a journey to understand the artistic process and what can happen when it goes wrong. That might explain why it’s so frustrating when The Unfinished Swan takes away its best, most creative toy after the first 20 minutes. Monroe first enters the storybook world into featureless white space. It’s everywhere, in all directions—a blank page. And like a blank page, the dead space is initially paralyzing. What do I do here? Am I actually playing the game? A pull of the controller’s trigger produces a splotch of black paint that splatters on a nearby wall. Now you have the means to create perspective, a way to map and decipher your previously inscrutable surroundings. It’s a memorable reveal of your relationship with the physical world. As you progress through the opening stage, you can paint anything that you want, creating a trail of minimalist art in your wake. This process elegantly combines the need for navigation and progression with an opportunity to shape the world to your liking. At the end of the stage, you reach an elevated precipice. From a distance, the landscape is nothing but disjointed trails of blackness, a personalized painting on a private canvas. Seeing it from afar let me look back at my handiwork, strange and disjointed as it was, and say, “I made that.” The world responded to me and gave me a way of making a mark, letting itself be a canvas for my brush. Then the game introduces color and contrast. The levels become navigable without the aid of paint, and instead of black paint, your “weapon” turns into a light watercolor that fades away within a few seconds of landing. Just like that, the canvas and the brush are gone, and the sense of control and creation they engender is gone with them. Games are constrained in a fundamental way: Nothing exists that the developer didn’t make. This isn’t a problem, per se, but it is a challenge for a game that seeks to give the player a real sense of agency or artistry. Your choices are always constrained, and it’s always clear that this is the developer’s toy box—not yours. The painting in Swan’s first chapter provides an ingenious compromise in favor of player creativity. By offering you a free-form ability to shape the environment, the developers carved out a space for expression within the constraints of a linear, story-driven puzzle game, where each path is designed to take you to a single place. But Monroe’s later methods of interaction don’t provide the same sort of creative play. In the game’s second chapter, for example, he is introduced to kudzu-like vines that are invading the king’s otherwise pristine (but wholly abandoned) village. Firing your watercolors onto the vines causes them to grow wildly, creating bridges and climbable paths that give you a way to navigate through the town. At first blush, this feels like an iteration on the painting from earlier, providing you with a means of making your own mark on the world through the guided growth of these plants. But any attempt to manipulate the vines proves impossible. They grow on predetermined paths, and your only option is to feed them and follow their trail. Unlike the painting, the vines provide progression in a direct and mindless sense, more functional than creative. You just accede to the game’s demands. Give Swan the right input, in the right place, to get the ladder here and bridge there. The vines offer an illusion of openness without actually providing it, and when that illusion breaks down, it serves to reinforce the constraints of the game—a reminder that, no, you’re here to play by the rules. This rote design is a missed opportunity. In exploring the ruined world of a mad artist, The Unfinished Swan challenges its players to explore the wildness and unpredictability of art—how creation can transform from play into something transcendent and potentially dangerous. The opening section gives teeth to this idea, letting you create even as you’re challenged to think about creation. By the end of the game, however, you’re practically a spectator to the artistic process and that immediacy you once had is never restored. There’s insight to be had here, about learning through action and creation, but like the swan, it remains unfinished.